Edward Hardy is Chief Executive of the Considerate Constructors Scheme. Here, he provides a summary of 2017 and an insight into what’s in-store for the Scheme in 2018 and beyond. 2017 has been another very successful year for the Scheme, with a great range of activities taking place – all making a hugely positive impact on helping the industry to continually improve. 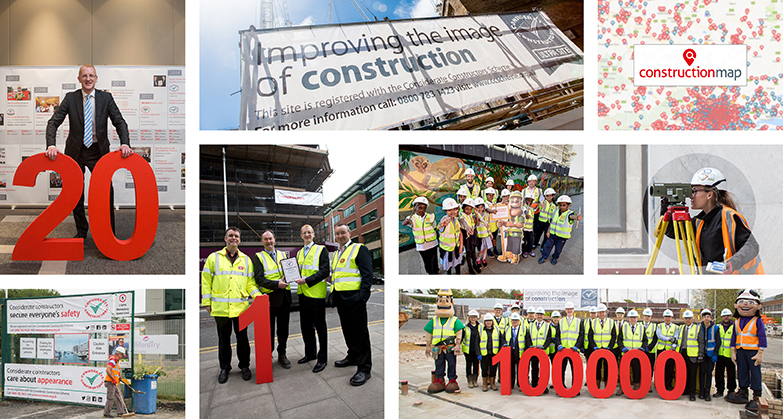 2017 was a very special year for everyone committed to improving the image of the construction industry, as it marked the 20th anniversary of the Scheme, and the year in which we reached the impressive milestone of registering our 100,000th site. In Spring, we brought all the Scheme’s monitoring models together as one single brand identity – with one logo representing all forms of registration. May saw the Scheme going international, with the launch of Scheme registration in Ireland. In July, our Ultra Sites proposition was formally launched, and continues to receive a growing number of requests from sites to become an Ultra Site – the highest standard we have. In October, the industry welcomed the first-ever online Construction Map of the UK and Ireland. Pioneered by the Scheme, our www.constructionmap.info is proving to be an essential tool for the industry and Public. There are so many other things to discuss about 2017’s achievements, such as our First Impressions campaign, our Image of Construction event and Professional Partnership – all of which, plus many more achievements, will be available to read in our 2017 Annual Review brochure. Please keep tuned in on our website, Industry Image online magazine and social media channels, for the publication of the Brochure and all the latest news and developments to find out what we are up to this year. With 2017 behind us, we are now looking ahead to 2018 and beyond. We are delighted to confirm that there are no major changes to our Checklists for 2018, with the 2017 versions continuing to be used on all site, company and supplier visits. As in each year, there has been a small annual fee increase across all registrations that came into effect from 1 January 2018. Full details are available on this website. The sixth annual Ivor Goodsite Hoarding competition kicks off later this month. It follows the hugely successful launch of the first ‘Honor’s Big Build’ competition in 2017, which saw contractors engage with over 900 school children and young adults across the country to create iconic buildings using recyclable materials. Our Best Practice Hub continues to go from strength to strength and is being refreshed to improve its usability, look and feel. In particular, searching for examples of best practice will be easier and more intuitive, and there will be far more day-to-day best practice examples available. Our ‘Spotlight on…air pollution’ will be published in the first quarter of 2018, as will a brand new e-learning module focused on women in construction. 2018 also marks the Scheme’s partnership with the ecobuild event in March. This partnership has been created to develop a model to enable industry events to operate to the highest levels of consideration by looking at how they impact upon communities including attendees, those who work at the event and the natural environment. This will, for the first time, enable industry events to brand themselves as ‘considerate’, assuming they are happy to meet the Scheme’s usual high standards. I would also like to take this opportunity to thank everyone who continues to support the Scheme and our drive to improve the image of construction. I wish you all a happy and successful 2018.